If you're wondering why driving to work has gotten so expensive, you might want to peruse your pension fund's investments. That's because speculation by institutional investors pouring money into the commodities market may be largely to blame for spiking oil prices, according to testimony on May 20 before the Senate Committee on Homeland Security & Governmental Affairs. 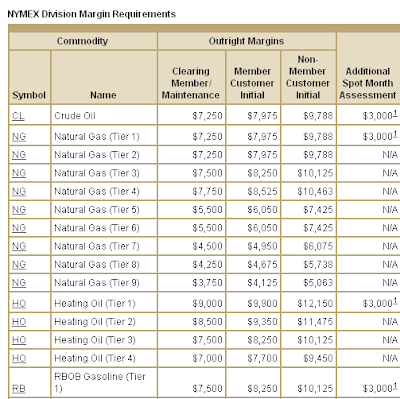 The margin requirement for trading commodities on the NYMEX is 6%. So one oil futures contract 1,000 barrels of crude worth $131,000 can be leveraged with only $8,000 of margin money with a reserve kicker of $3,000. 16 to 1 is pretty good leverage. Another thing to look at is the amount of oil we use. 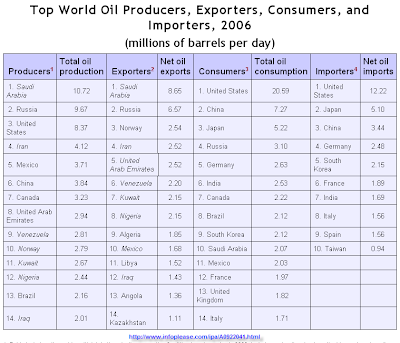 The US consumes about 22 million barrels per day (b/d), China about 7 million b/d. Total world production is about 87 million b/d. China is not about to set the world on fire with an increase in consumption any time soon. We are the gas hogs, and at these prices you can bet your bottom dollar that we are consuming a lot less gasoline. Look at the Consumer part of the list below. There is not much credibility to the idea that the Chinese are gobbling up oil. Back in the 1970's we had a supertanker glut. They produced too many. It looks like we have another now.Here's a curious tidbit from Crude Production Blog dated April 18, 2007 (13 months ago). The cost of transporting 2-million barrel consignments of crude oil from Middle East ports on supertankers may extend a three-week decline because there are too many ships available for hire. About 104 tankers can reach Persian Gulf ports by May 18, according to a report today from Paris-based ship broker Barry Rogliano Salles. That's already enough to cover the entire month's demand, based on April shipments. More vessels will become available later in the month, increasing the glut. The biggest supertankers can hold 550,000 tons of oil at 7.2 barrels per ton, which is about 4 million barrels, figure about 4,000 futures contracts. Round trip time from Saudi Arabia to New Orleans is 65 days. Maybe they are full and sitting parked somewhere waiting for oil to hit $200 a barrel. What's going on??? Refineries are probably cutting back on production of gasoline; people are cutting back on driving. Inventory has to be building up. We have an unknown number of tankers that could be hiding large quantities of oil. We have a lot of investment funds that got burned on real estate, the commodities market could be their last chance to get whole (or get sucked into a black hole). Look at the chart above. It's a three year chart of the oil futures. Looks a little like the housing bubble. Nah, it's just my imagination running amok again! In the fall of 1979, the Hunt Brothers, along with some wealthy Arabs formed a silver buying pool and bought up 200 million ounces- the equivalent of half the world's deliverable supply. The price of silver had moved from $2 per ounce in 1973 to $5 per ounce in early 1979 and then rocketed as high as $54 in early 1980. The officials at COMEX moved to check this cornering of the silver market by raising margin requirements [by only allowing liquidation orders]. The highly leveraged Hunt Brothers were unable to meet their margin calls, and were forced to sell. The price of silver fell dramatically; on March 27th 1980 the price fell 50% in one day, from $21.62 to $10.80. The Hunt Brothers were forced to declare bankruptcy. Bache Group, which handled of the trades for the brothers, was financially ruined. Oil has gone from $55 a barrel on up to $132 a barrel. Inflation could account for about $30 of that increase. I wouldn't blame this mess on the oil companies, this has all of the ear marks of a speculative corner of the oil market by parties unknown. The commodities markets are going to have to limit the number of contracts written and only accept liquidation orders like they did with the Hunts. It's kind of like sticking a broom handle into the spokes of a moving bicycle. It will be quick and brutal. Hold on to your SUV and your hat, another bubble is about to pop. A couple of weeks ago Congress had an investigation on big Oil. One of the Senators asked the oil man why they didn’t pass the profits down to the consumer (I guess it’s not right to make a profit in the United States). The CEO said that he didn’t think it was practical. Then yesterday the local channel had a bit on retail legalized marijuana stores here in California. They asked the vendor what the sale price was per ounce and she replied “We keep it at the same price as the illegal stuff, if we didn’t, we would be supplying street users who would still sell at their regular price.” It kind of seems like the dope dealers of this country understand basic economics better than our elected representatives. Gas prices are going through the roof. 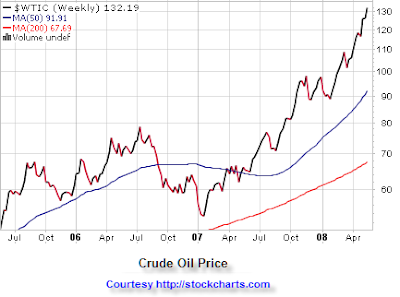 At these prices there is going to be a lot of oil entering the market, probably more than the consumer can use. At some point prices have to drop. It’s a little like the housing bubble. As prices rose, more houses were built. Now we have a large supply and no one now really wants one. The odd thing here is that Congress wants to maintain the high housing prices in order to keep the real estate market stable. If gas prices collapse, would we have a gas bailout also? Congress can run investigations on why things are more expensive. In reality, the items we purchase don’t cost more, the currency is worth less. Counterfeiting is against the law, but spending more government funds than you collect in taxes is not. Let’s face it, the 160 billion dollar tax stimulus was not real money, it was not earned by anyone. From a simplistic economical view, a worker makes 100 dollars worth of widgets and at the same time, the government prints $100. There is now 200 dollars chasing the produced widgets. This item didn’t double in price. But, by God, Congress is going to grill and roast that widget maker. How dare anyone gouge John Q Public? You can't see the smoke and the mirrors but they are there. The average person has no idea that Congress is the problem. Isn’t it amazing how politics can solve our economic problems with just a printing press? It’s kind of like trimming your toenails with a guillotine. The solution is a problem. If you are newspaper editor, the politician with the best ideas is out of luck. You need controversy, that sells papers. The media picks a “Clash of Titans,” and runs with it. So what do we have, “Hillary vs Obama.” I really can’t figure this out. In my opinion, the Democrats had the election won if they picked anyone except those two. Either one of them would have been fine VP material. Then you go over to the Republican side and we have someone pushing 70. From a journalistic point of view, the Democrats are news and the Republicans are “Wet paint on a wall drying.” The Democratic Party is eating this up. Press coverage up the ying yang. Who cares who wins, Joe voter thinks that the Democrats are on a roll. After the Presidential primary on both sides, each party will have to choose a vice president. Examine who is chosen closely; one of them may be our next president. McCain has to pick someone old enough to hold the office. Obama would have to pick a white guy. Hillary could put Bill on the ticket as the VP. I am making fun here, but there are serious issues that are not being discussed. We have a political mix here that is beyond being lousy. We have a woman who wants to be our mom, a young guy that wants to lecture us on what we are doing wrong and and old guy that's scared to buy green bananas. It’s a vote against the people you don’t like as president. People do not like to support losers. So with the Democratic Party, half of the supporters are automatically losers. If Hillary loses, those Democratic votes are gone. If Obama loses, I see the votes switching to Hillary. The real thing to remember here is at the convention, after the first vote, all of the delegates are released from their voting commitments, look for an even split between the two candidates up and to the convention. After the first vote, we have a free for all. It could prove interesting. My sneaking suspicion is that Hillary wins and Obama is offered to be the VP. You got to admit a woman and a black running for president, it's a little like an Arab running for president in Israel. It's going to sell some papers, but is the reality factor really there? As for the Republican convention, I think that the Vice Presidential selection will be the make or break for the party. It will probably be a younger governor of some state. Examine the typical voter. This person actually thinks that things are going to change after the election because of the election. Wrong! Things are going to change because a lot of stuff is becoming unglued. There isn't too much to fiddle with if you look at this picture of the budget. We need to vote for fiscal responsibility. Balance the damn budget. The inflation we are experiencing is a tax. When someone says we need to strike back at the oil producers for this price increase. Think again, our government is printing too much currency. It’s a little like chopping a hole in the bottom of your boat. The people in the boat notice that the water level on the outside of the boat is rising. It’s a great observation but that’s not the problem. It’s the nut [insert your Congressman's name here] with a hatchet. A Time magazine article April 4th pointed out that 1/5th of our corn crop was diverted (hijacked) to ethanol refineries. Corn prices have shot up and American farmers are planting less soy beans. Brazil in turn has increase soy bean production. Of course they are burning down a rain forest to do it. This ethanol lowers our dependence on foreign oil and at the same time increases the price of beef. We get to save a dime on gas and get to choke on the price of ground round. 20 years back in Africa, the UN showed starving people in one country how to plant crops and use fertilizer. The net result was increased food production and an increase in population. One thing little noticed was that families needed firewood to cook with. Once the country was denuded of trees, the farm land washed away with the rains. A great plan ran amok because of firewood. People died as a result. The government and Congress are going to save Bear Stearns, Countrywide, give everyone who paid taxes $600 dollars and keep the economy out of a recession. You know they mean well, but maybe just doing nothing might be a better approach. My only question is this; whose money are they going to do it with? Don't they have to tax people to raise the cash? We are going to poorhouse in an air conditioned limo, forget the hand basket to hell, that’s step two (when YOUR healthcare runs out). The voters seem to think the political party in power is responsible for our present situation. From a more realistic view, what we are experiencing today, is the result of plans put in motion 5 to 75 years ago. Clinton in 1999 signed the repeal of the Glass-Steagall Act (from the depression) which freed up the banking system (you can kind of see where that went). The final outcome could be the reverse of what was intended. The real issue here is that the solution can result in a bigger problem. Note also, the people with all of the solutions, are usually part of the problem. Time is the only true test. The real estate market may seem to be just one issue, but it is intertwined with the banking system, the economy, Wall Street and government. Change one program and everything else moves in some unintended way. It's a little like taking Viagra, only to have your hemorrhoids swell up. You knew what you had in mind, and it certainly didn't involve a lot of pain! Our Government works almost in the same manner. 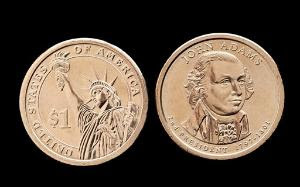 Here are two pictures; the new Presidential dollar and an old silver dime. Just for a laugh, which one is worth more? Answer, the silver dime is worth about 60 cents more. Let's add to this, the health care package for seniors. Imagine, at the age of 55, your health insurance cost is $300 per month. What a relief that at age 65 it will be free. I am still talking BUBBLES and this is bigger than all of the rest. This bubble is not going away. Give it another 15 years before it's visible. The real question to ask; "Is it possible to believe that we, the people (the government) are really going to pay for what, we the people, (as individuals) could not pay? If the stock market turned bearish and started to drop drastically, your mutual fund portfolio would drop in value. At this point you have three choices; withdraw your funds, switch to a non stock portfolio with the fund, or do nothing. With withdrawal, you could face an early withdrawal penalty of 5% or as with the tax deferred accounts, an IRA penalty on top of that. Notice that 52% of the investors have the option to withdraw without tax penalties. The rest probably have the option to switch from stock to money market funds. Here’s where things start to become unglued. The mutual stock fund facing redemptions has to sell stock for redemptions, and also for the transfers being made to money market funds. The stock fund manager is sitting in his office wanting to buy the market, everything is at a discount. What’s he being ordered to do? Raise cash! So what’s he about to do? Sell into a declining market. I just hope they don't try to sell the whole 23%. The real disconnect that I see in the mutual fund market is the interest in the foreign funds. The Asian markets are touted as a "New Frontier." My jaw can't drop that low, I'm just too old. When Templeton suggested to buy that market, the absurdity of the idea boggled my mind. Don't go there! Foreign mutual funds in a panic could be dead meat. The natural instinct in foreign countries, in a panic, is to dump the local currency for U.S. dollars. The first thing that their government would do to stem the tide is to pass laws against repatriating the currency. In this case, you could cash in the foreign stock fund into local currency, but what good will that do, you can't convert it to US dollars? I'm not even touching on the corruption in third world Asian markets, Japan included. So what happens if the stock market drops like a rock? The investors in these stock mutual funds are going to pull out of the fund or wish they had. This will force the money managers to sell into the abyss. In the 1930’s they called it “A run on the bank.” In 2001 it was called a 50% haircut. Get ready for the Mutual Fund Run and by the way, it's not a marathon! I was just listening to Karl Denninger’s U Tube expose on the government stimulus package. I pretty much agree with his math, and what it will cost the average home owner, but I believe that the Fed and Congress have with a little miss-direction, something else in mind. The problem is far bigger. Don’t believe for one minute that Congress decided to give us a stimulus check. Examine the S&L collapse of the 1990’s. We, the tax payers, paid over 100 billion to bail out the banks. This is just a different approach, kind of a pre strike initiative. The ultimate goal is to inject the cash into the banking system, resulting in increased liquidity for the financial markets. The average Joe on the street thinks the government is doing something for him. Yea right! To view it in a different light, everyone’s savings was just taxed at 10%. No tax was collected. $10k in the bank now has the purchasing power of $9K. Deposit the check and $10K becomes $11K but it's only worth $10K. The taxpayer got nothing out of the transaction except a warm and fuzzy feeling that the government did something good for them. As Karl mention, we got screwed by Congress and we thanked them to boot. The irritating thing is a majority of people have no idea what we are discussing here and I am afraid it will remain so. The Fed (Bernanke et al) and Congress are trying to keep the financial system from imploding. Any solution, in this case, no matter how ever far fetched, is worth a try. Their reasoning, "It’s at least a 2 to 20 trillion dollar mess. 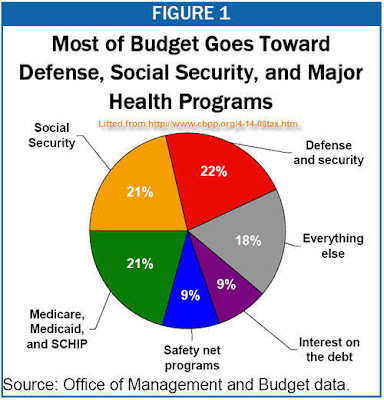 If we can spend 5% of that and keep it from happening, it is well worth the investment." The alternative is an inconceivable financial collapse. This is a "Hail Mary Pass" for the end zone. The only trouble is, this isn't the last seconds of the 4th quarter. Government can't create money out of thin air. 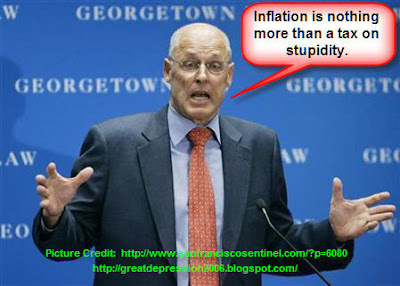 Inflation is a government tax. Accept that as fact, and the picture becomes clearer. In algebra, adding the same amount to both sides of the equation does not alter the values. If you want to call it a Stimulus check, be my guest. There is one problem that everyone is glossing over here. Two to twenty trillion dollars has been lost. Whose money was it? There is only one place with big money like that, our retirement savings plans. Let's keep quite about this; we sure wouldn't want to start a panic. Don't pay any attention to the pictures; they have nothing to do with what I'm talking about (I'm lying). Double click the picture above for a larger image, you need to read the fine print. A $100 doesn't go far any more. 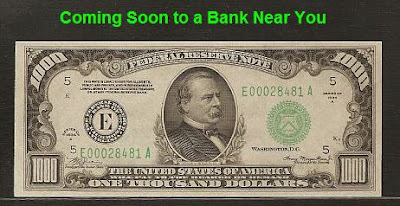 Look for the $1,000 bill to be reissued back into circulation. Do you notice a pattern starting here? ?